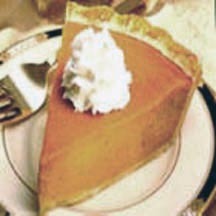 Warm, aromatic cinnamon, ginger and clove add their distinctive flavor to classic pumpkin custard pie—the holiday pie of Thanksgiving. In a large bowl combine pumpkin, condensed milk, sugar, milk, eggs, cinnamon, ginger, cloves and salt. Arrange crust in 9-inch pie pan; pour in pumpkin mixture. Pour into unbaked pie crust. Bake for 10 minutes. Reduce heat to 300°F and bake an additional 45 minutes or until center is set. Remove from oven and cool completely on a wire rack. Serve with whipped topping if desired.